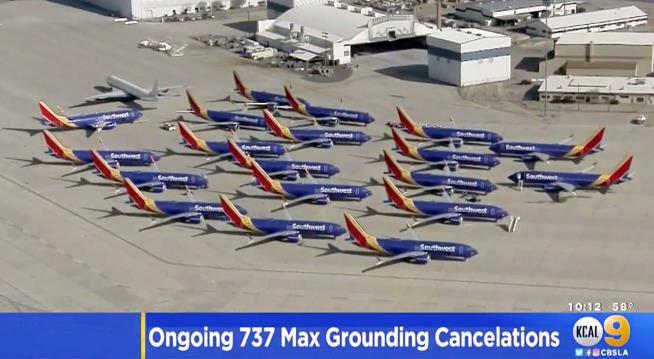 (Newser) – A Southwest Airlines Boeing 737 Max made a safe emergency landing Tuesday in Orlando, Florida, after experiencing an engine problem, the Federal Aviation Administration said. The crew declared an emergency after taking off from Orlando International Airport around 2:50pm, and returned to the airport safely, the AP reports. No passengers were on board; the aircraft was being ferried to Victorville, California, where Southwest is storing the airplanes. The 737 Max was grounded in the US March 13 after a deadly crash involving a Max in Ethiopia on March 10. It was the second fatal crash involving the airplane. US airlines are allowed to shuttle the planes but cannot carry passengers. The FAA says it's investigating but the emergency was not related to anti-stall software that is suspected as a cause of the two fatal crashes including one last year involving a plane from Indonesia. Airport spokeswoman Carolyn Fennell says one of the airport's three runways was shut down for cleaning after the landing. She says it's standard procedure to check a runway for debris after an emergency landing. It wasn't clear if any parts actually fell off the plane. Fennell says the airport's other two runways remained open, and normal operations weren't affected. Southwest did not immediately respond to email and telephone messages left by the AP. They stopped making safe & reliable 747s for this? How do they select pilots to fly these possibly-suicide missions to storage in Victorville? "Hey, Sally, you drew the short straw this time." Sure are alot of issues for a brand new plane.